The Hive Tyrant is the battlefield leader beast for the Tyranid swarm. It's a giant monstrous creature, able to kill entire squads and slice through battle tanks with ease. Able to be equipped with a variety of close combat and ranged weaponry, the Hive Tyrant is sure to have the right weapons to carry out its job. 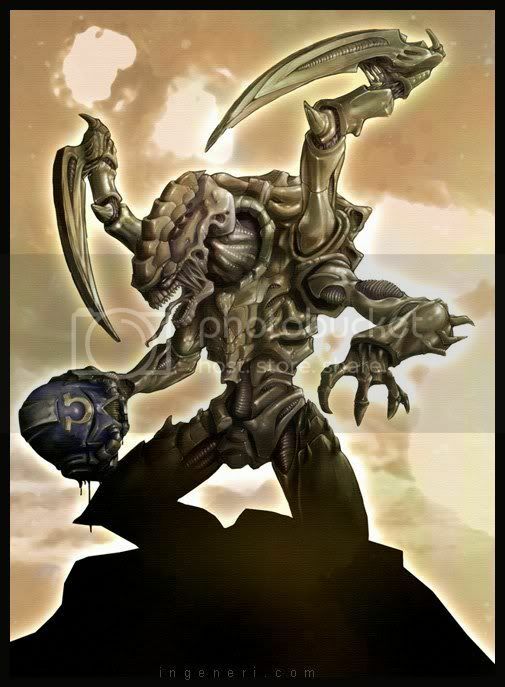 The Hive Tyrant is a Monstrous Creature, meaning it ignores armour saves in close combat, and roles 2D6 for armour penetration against vehicles. It's also a synapse creature, meaning anything within range automatically passes all leadership tests. Overall, it's designed to fill whatever need you have in your list, able to tackle anything that can be thrown at it. Here's the build I'm currently trying out. Just because you've equipped your Hive Tyrant to the way you want it, doesn't mean you can just start charging forward in the hope of reaching your opponent's lines. The Tyrant may be tough and strong, but it's not invincible in any sense of the word. Winged close combat Hive Tyrants require a lot of skill to use. You can't simply charge forward, or you'll simply be gunned down. Use what you got. Rather than use the wings to get close as fast, stop behind that piece of terrain if it's tall enough to cover you. If you have Flesh Hooks, hop over that wall to shield yourself. Instead of placing him in the center of your force, playing him off to the side on a flank. This might give you more terrain to hop between and less resistance you'll face before you close into his ranks. Something you can try is to shield him with a squad of Gargoyles. They're fast enough to keep up with him and gives your opponent a choice to make. Shoot the Gargoyles and let your Tyrant close the distance, or try and shoot the Tyrant. This means that your Gargoyles can shoot forward and tie up one of the squads, giving less resistance. Either way, one of these squads is going to make it to close combat with your opponent. Overall, you want to send your Tyrant into something he can kill enough of to prevent being hurt, but large enough to keep him from wiping them out in your turn. This saves you from retaliation in the form of massive guns beings leveled at your friend. You want the squad to be wiped out in your opponent's turn. Allowing you to move and assault another squad and keep yourself save. Since we have two distinct builds, I'll cover each in turn. First, we'll start with the Devourer Tyrant. The Devil Tyrant (Devourers) is just as fast as the close combat Tyrants, and much of the same tactics apply. However, you have to be more careful about choosing your target. Due to the range of the Devourers, you will be putting yourself right in range of most anti-tank/MC weapons. Because you're not tying yourself up in close combat, you can find yourself out in the open after decimating a squad. Thus, it's very handy to try and place area terrain or large enough terrain between the Tyrant and the rest of your opponent's army. And because the Tyrant still ignores armour saves in close combat, you can charge in if you find yourself needing to. The walking Tyrant is a different story. Due to the Tyrant Guard most likely accompanying your Tyrant, you don't have to rely on terrain quite as much. This build relies on choosing its targets more carefully than the others, due to the smaller number of shots. Devastator squads, Heavy Weapon squads, and the new special weapon squads are all viable targets. Cover is still vitally important, protecting yourself from assaults and all those nasty lascannon shots and such. The Hive Tyrant is a powerful model to have in your army. Whether shooting or close combat, he can get the job done. However, don't throw him around just willy-nilly. He requires patience and strategy to serve his purpose in your army. And remember, it's not always about killing the most. Sometimes it's about the fear factor that your Hive Tyrant can produce.